A glorious, romantic, and competitive era of Cuban amateur baseball was the early 1940s.1 During that time, there was a quartet of star pitchers: Conrado Marrero, Julio Moreno, Rogelio Martínez, and Sandalio Consuegra. All four entered the big leagues in 1950 with the Washington Senators. Consuegra – often known as Sandy in the U.S. – had the longest career and most wins in the majors. He was 51-32 with a 3.37 ERA from 1950 through 1957, with the clear peak being 1954. At the age of 34, he led the American League in winning percentage (.842) with a 16-3 mark for the Chicago White Sox. After beginning his amateur career in Cumanayagua, Consuegra then played with Regiment 7 of the Cuban Armed Forces from 1936 through 1940. Roger Consuegra recalled, “At age 16, my father decided he wanted out of their rural existence and one day after work buried his mocha (a machete to cut sugar cane) in a wood column in the porch of the main house. According to him, he told my grandfather he was through with farming and was going to join the armed forces (Regiment 7), where he played ball and rode with the equestrian teams for the regiment. Potrerillo was supposed to make his debut in US pro ball that year, having signed with the Minneapolis Millers, which were then unaffiliated. The Millers had brought in a number of other Cubans, including pitcher Isidoro “Izzy” León.19 As The Sporting News wrote that May, “Manager Rosy Ryan, catcher Jack Aragon, and other members of the club’s Cuban contingent stormed the telegraph offices to bombard Sandalio Consuegra with wires urging him to report. Consuegra, who is rated a better pitcher than León, failed to report with the other Cubans because he wasn’t sure he could make the grade.”20 Then again, he could have been in need of rest after the amateur league season, even though the games were played only once a week on Sundays. In the winter of 1945-46, Potrerillo turned pro at last, joining Tigres del Marianao of the Cuban Winter League. He got into five games and was 2-0 with a 2.86 ERA. The following spring, he made a decision that strongly influenced the course of his career: He went to Mexico. The 1946 season was when wealthy Jorge Pasquel made his push to put the Mexican League on the same level as the majors, fueled by higher salary offers. For Hispanic players, though, language and a more similar culture were also good reasons. Consuegra went 14-13, 4.72 for the Puebla Pericos in 1946; that staff also featured 20-game winner Sal Maglie. Consuegra followed with 8-11, 3.06 marks for Marianao that winter. In 1947, the Havana Cubans – then a Class C farm club of the Washington Senators – wanted Sandalio to join their staff. If he had come, Consuegra would have joined Marrero, Moreno, and Martínez. Instead, another Cuban pitcher, Tomás de la Cruz, persuaded him to go back to Mexico. Havana club president Merito Acosta pressed charges against Consuegra, seeking damages of $1,600. “Acosta said he took the necessary steps to have Consuegra reinstated [since the Mexican League had become an “outlaw” circuit], signed him and advanced money to him.”22 With Puebla again, Consuegra trimmed his ERA to 3.36 while winning 10 and losing 10. Cuba had a new league in the winter of 1947-48: La Liga Nacional, or Players’ Federation League. Consuegra started with Santiago, but after that club disbanded on December 15, he went to Leones. His overall record was 13-8, 3.76. The league completed the season but was defunct thereafter. That winter Consuegra played alongside Sal Maglie, Max Lanier, and others who became outlaws for jumping from the majors to Mexico in 1946. This had an ongoing effect on his ability to play in Organized Baseball – and many winter leagues – until the ban was lifted. That fall, in the Inter-American Baseball Tournament at Caracas, Consuegra threw a no-hit, no-run game against host team Venezuela. Center fielder Pedro Pages preserved the gem in the ninth inning with a catch after a long run.29 The winter of 1949-50 was Sandalio’s busiest in Cuba. He was 13-12 for Marianao, leading the league in innings pitched and losses. Consuegra lost his last three decisions to finish at 7-8, 4.40 in 21 games (18 starts). He pitched poorly in 17 games in Cuba that winter (4-8, 6.10), and Clark Griffith instructed him to stay out of winter ball for fear of sapping his strength.32 Sandy started the 1951 season with a bang for the Senators, throwing three straight complete-game victories and allowing just one run in each. As the season wore on, though, Consuegra may have worn down. Manager Bucky Harris used him much more in relief (12 starts in 40 games), and he finished with numbers similar to 1950’s (7-8, 4.01). Consuegra did not pitch in the winter of 1951-52, and with the Senators in 1952, he started just twice in 30 games. He was effective in his limited action: 6-0, 3.05 in 73⅔ innings. Having skipped winter ball again in 1953-54, Consuegra may have been fresher in the spring of 1954. Manager Paul Richards said, “[He] will be our number three pitcher and I wouldn’t be surprised if he is our number two pitcher.”37 As the season unfolded, Richards was right in some important ways. Starting 17 games and relieving in 22 others, Consuegra was tied for second on the club in wins, along with Bob Keegan, behind 37-year-old ace Virgil Trucks. Along with his 16-3 record, Sandy led the club in ERA (2.69). “A friend frantically informed [Consuegra] he still needed a few innings to reach the then-required total of 154 to qualify for the percentage title. Consuegra sprang into action.”41 He threw two-thirds of an inning at home on September 19. The following day, at Cleveland, he threw three scoreless innings, then on the 21st he ended the game by getting Dale Mitchell (always a tough out) to fly to right. That got him to 154.0 innings pitched on the nose, and he did not appear in any of the club’s remaining three games. After another winter off, Consuegra remained effective for Chicago in 1955: 6-5, 2.64 in 44 games (seven starts). Coming back to Cienfuegos that winter after two seasons away, he continued to pitch well, mainly out of the bullpen. The Elefantes won the league championship, and so in February 1956, he went to the Caribbean Series for the first and only time. In his lone appearance, he lost to Puerto Rico (the only loss for the Cubans in the round-robin tournament). Consuegra’s performance fell off with the White Sox in 1956 (1-2, 5.17 in 28 games). In late July the Baltimore Orioles – where Paul Richards had jumped in September 1954 – purchased his contract. Consuegra didn’t want to go to Vancouver in the Pacific Coast League, which was then Baltimore’s top affiliate. “Too far place,” he pleaded with Richards, who then arranged for him to play with the Havana Sugar Kings (in the Cincinnati Reds chain).44 The Orioles called Potrerillo up in September, and he got into four games. Back with Baltimore in 1957 after just 10 winter games with the Elefantes, Consuegra made just five appearances through early May. On May 14 the New York Giants purchased him from the Orioles as Baltimore got down to the 25-man roster limit. Sandy came out of the bullpen four times for the Giants. His final game in the majors was May 28, 1957. Roger Consuegra said, “The hitter he could not get out regardless was Forrest Jacobs of Philadelphia. I think he broke up a no-hitter once. Also, Larry Doby was not an easy out for him.” Indeed, Spook Jacobs – who also played a good deal in Cuba – was 7-for-18 (.389) in the majors against Sandy, including the Athletics’ only two hits on May 3, 1954. Doby was 12-for-31 (.387) with four homers. “His first job, working at the cargo department of an airline, lasted many years. It was also made possible by another ballplayer, Francisco Campos. After that he worked as a security guard until age 62. His inability to speak English did not help, as I recall taking calls from the Houston Colt .45’s – Paul Richards – and hearing about offers for jobs as scout and trainer for Latin pitchers. But it meant also a move to Houston, and my mother said no and that was the end of the story. Nonetheless, Consuegra was one of many former Cuban pros in the Miami community who gave his time to Los Cubanitos, the youth baseball program founded by Emilio Cabrera in 1961. The Facebook page that commemorates Los Cubanitos shows photos of Sandalio – “a nice man who loved to teach and loved the game” – with 1969 and 1970 squads. “He enjoyed Los Cubanitos,” said Roger, “and Emilio Cabrera was one of the few he called friend as time went by. “He also played in several Cuban old-timer’s games, or Juegos de Recuerdo. He enjoyed these while they lasted and even played center field in one of them.” The Cuban Baseball Hall of Fame (in exile) inducted Consuegra in 1977. Sandalio Consuegra married Blanca Ramos on July 28, 1943. They had three children: Rogelio, Silvia, and Norma. “My parents were married for 60 years,” said Roger, “and when my mother died in 2003, it zapped his will to live. He became bitter and felt alone in spite of having his children and grandchildren around. He died after falling and breaking his hip.” The end came on November 16, 2005, in Miami. “He never mentioned how he would like to be remembered,” said Roger, “but I think he would be quite happy to know that many folks who knew him, think of him as one of the most humble and affable persons they knew. To this day I am surprised at the amount of people who remember him – or, hearing my last name, ask if I am related to the ballplayer. An updated version of this biography appeared in "Cuban Baseball Legends: Baseball's Alternative Universe" (SABR, 2016), edited by Peter C. Bjarkman and Bill Nowlin. Grateful acknowledgment to Rogelio Consuegra, Silvia Consuegra-Vélez, and the entire Consuegra family for participating in this remembrance of Sandalio Consuegra. Continued thanks to Rogelio Marrero in Cuba (amateur statistics). Figueredo, Jorge S. Who’s Who in Cuban Baseball, 1878-1961 (Jefferson, North Carolina: McFarland & Co., 2003). Treto Cisneros, Pedro, ed. Enciclopedia del Béisbol Mexicano (Mexico City: Revistas Deportivas, S.A. de C.V.: 11th edition, 2011). The Sporting News Baseball Register, 1956. 1 Cuban amateur ball in the post-revolution era can certainly be termed glorious and competitive as well (perceptions of “romantic” may differ). 2 John C. Hoffman, “Plantation Pitcher,” Baseball Digest, September 1954: 17. 3 Danny Peary, We Played the Game (New York: Hyperion Books, 1995). 4 Hoffman: 15. Note that baseball references have shown his mother’s family name as Castelló, but the family has corrected this. 5 Roberto González Echevarría, The Pride of Havana (New York: Oxford University Press, 1999), 220. 7 E-mail from Roger Consuegra to Rory Costello, November 14, 2011. 11 Peter C. Bjarkman, A History of Cuban Baseball, 1864-2006 (Jefferson, North Carolina: McFarland & Co., 2007). 12 Peter C. Bjarkman, Diamonds Around the Globe: The Encyclopedia of International Baseball (Westport, Connecticut: Greenwood Press, 2005), 6. 14 Marino Martínez Peraza, “Un Mosquetero del Deportivo Matanzas.” El Nuevo Herald, May 29, 2010. 15 Jorge Alfonso, “Amplitud del Horizonte (II).” Béisbol Cubano website (http://cubasi.cu/beisbolcubano/historia/amplitud-del-horizonte-II.htm), April 9, 2007. 17 González Echevarría, 246. In the majors, Consuegra hit .170 (37-for-218, with two doubles). 19 Halsey Hall, “Millers Land Cuban Cargo,” The Sporting News, March 15, 1945: 9. 20 The Sporting News, May 3, 1945: 18. 21 Roberto Rodríguez de Aragón, “Rogelio Martínez, el grandioso ‘Limonar,’” Libre Online, June 9, 2010 (http://libreonline.com/home/index.php?option=com_content&view=article&id...). 22 “Cuban Press Raps Jump by O.B. Player to Mexico,” The Sporting News, April 23, 1947: 16. 23 Pedro Galiana, “Mexican Jumpers Balk Over Pasquel Pay Cuts,” The Sporting News, February 5, 1948: 21. 24 Jorge Alarcon, “Six Mexican Loop Players Jump to O.B.,” The Sporting News, August 18, 1948: 29. 25 “De la Cruz Plans 3-Nation Series,” The Sporting News, June 9, 1948: 1. 26 Menéndez Torre, Jorge. “El ‘Potrerillo’” (http://poresto.net/ver_nota.php?zona=yucatan&idSeccion=19&idTitulo=116410). 27 “Cubans Add Mexican Jumpers,” The Sporting News, August 17, 1949: 32. 28 Herb Heft, “Ortiz Speaks and Consuegra Makes Batters Talk Spanish,” The Sporting News, July 5, 1950: 7. 29 “Consuegra Pitches No-Hitter,” The Sporting News, October 5, 1949: 52. 30 United Press, “Sends Hurler Home,” April 7, 1950. 32 Shirley Povich, “Nats Inviting Batterymen to Camp Feb. 20,” The Sporting News, December 27, 1950: 13. 33 Morris Siegel, “Senors ‘Peetch Gude’ for the Senators,” The Sporting News, May 9, 1951: 3. 34 Edgar Munzel, “Hats Off! Sandy Consuegra,” The Sporting News, September 8, 1954: 17. 38 Associated Press, “Consuegra Takes Garcia’s Place,” July 12, 1954. 39 Danny Jackson (1988; 1994) and Jason Bere (1994) both gave up runs while failing to retire a batter – and thus recorded infinite ERAs. 40 Lew Freedman, Early Wynn, the Go-Go White Sox and the 1959 World Series (Jefferson, North Carolina: McFarland & Co., 2009), 52. 42 Even if Garcia had gotten the hook after two innings, though, he still would have edged Consuegra at 2.68. 43 David Nemec, The Official Rules of Baseball Illustrated (Guilford, Connecticut: The Lyons Press, 2006), 39. 44 “Consuegra Going to Cuba,” The Sporting News, August 1, 1956: 23. 45 Charlie Metro and Thomas L. Altherr, Safe by a Mile (Lincoln: University of Nebraska Press, 2002), 206. 46 Miguel A. Calzadilla, “Lions Begin Climb as Tigers Stumble,” The Sporting News, June 11, 1958: 57. 47 “Tigers’ Rookies Take Lumps,” The Sporting News, August 20, 1958: 35. 49 Email from Roger Consuegra to Rory Costello, November 14, 2011. 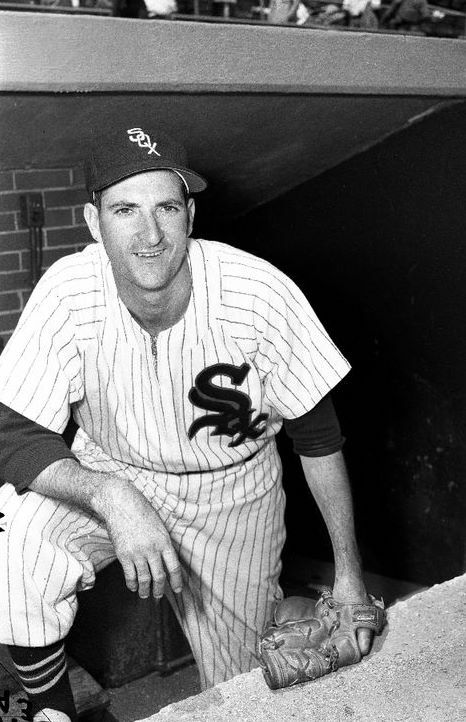 51 Alex Rostowsky, “Chicago White Sox: Ranking the 15 Greatest Pitchers in Franchise History.” Bleacherreport.com (http://bleacherreport.com/articles/836841-chicago-white-sox-ranking-the-...).